This post does not reflect the opinion of the coreboot project, but reflects the personal opinion of its author, Alex Gagniuc. Since the last time I talked about Purism’s stab at a coreboot laptop, a lot happened, including the launch of the non-libre Librem 15, alongside with plans for a 13″ version. My last post seems to have sparked quite some controversy on the subject, placing me on the CC field of many emails between not-so-happy supporters and Todd Weaver. I’ve avoided writing on this subject again, because I didn’t have anything good to say about Purism. However, considering the amount of new emails being generated lately, I think I should follow up on why the Librem 15 failed on the freedom front, and why another Purism laptop is just as likely to fail. A lot has happened since my last post, including a lot of media coverage on the issue. Now I can use acronyms like FSP, ME, and EC, without having to worry about losing 90% of my audience. It’s great that there is now a lot of non-technical coverage on the issue, something that non-corebooters can easily digest. However, some things also happened behind the scenes, which I’d now like to talk about. Todd, I think the overall concern with librem and your statements is the seeming lack of realization that you're walking over very well trod ground, and there are lessons learned, and we might as well pass them on. I for one seeing you making the same mistakes that have been frequently made over 15 years, and there's benefit to learning what we've learned. We will be releasing the source code once we get coreboot working on our rev1 which will be shipping within the next few weeks. Fast forward a few months later, after the email exchanges died down, I get a tip that the Librem 15 has shipped with AMI UEFI firmware. While I do not have a Librem 15 in my possesion, this has been confirmed by PC World. Although I hate having been right about this, I love saying this: I told you so. I’ve informed Todd that this developer is not a coreboot contributor, and for the purpose of our discussion, does not count as a coreboot “developer”. I’ve asked Todd to produce git hashes of patches contributed by one or both of the other two developers. He has not done so. Just this morning, a tweet was brought to my attention, which, to me, seems like a direct attack on Minifree from Purism. 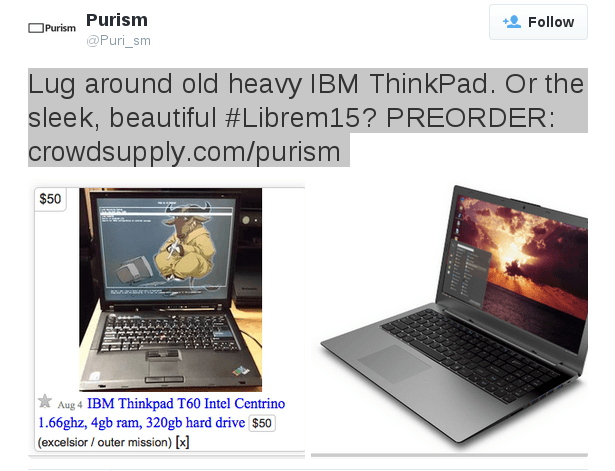 The tweet compared an “old heavy IBM Thinkpad”, with the Librem 15, showing the picture of a T60 Thinkpad running libreboot. This is also one of the pictures Gluglug (now Minifree) used on its product page when they were selling the T60 model. For those of you unaware, Minifree (formerly Gluglug) sells laptop systems which are completely free, from the OS down to the firmware, and which are endorsed by the FSF through their Respects Your Freedom certification. The Minifree laptops are what we, as the community have been working to achieve since the inception of LinuxBIOS more than fifteen years ago, and the reason I have stuck with the project for over half a decade despite all the difficulties and roadblocks. To attack Minifree is to insult all of our hard work over the years, and to me, it indicates that Purism really doesn’t give a damn about your freedom, but they really like your support and money. I know I promised I would also talk about why another Purism laptop is just as likely to fail as the Librem 15, but I’ve ranted enough for one post. I’ll describe that into more detail next time. Ouch, that is not an approved tweet. I asked to have it removed, since I am a big fan of what Gluglug did/does. And we provide it as an alternative from our own website. Purism Librem is an interesting project which promises to produce a completely libre laptop, designed to respect the user’s privacy and the user’s rights. The indivduals behind the project seem so confident as to “promise that a Purism system and all its components will be free according to the strictest of guidelines set forth by the Free Software Foundation’s Free Software Definition.” Can they deliver on this bold claim? I first heard about Purism Librem sometime last October, when someone on #coreboot posted a link to Purism’s ideas/ideology page. It promised a fully libre system, from the ground up, with a high emphasis on libre firmware. I only glanced over that page quickly before dismissing it as another over-ambitious and mis-informed project. There was no way that the Intel CPU and chipset they wanted could run libre, given Intel’s tight grip on the low level boot process. Coupled with their desire to include an Nvidia GPU — another high-profile offender in the libre software world — their ideas looked doomed. The first red flag was that we, the coreboot hackers, were never contacted by Purism about what it would take to get such a design up and running on the firmware side. We could have immediately told them that there are major pieces of the initialization path for their CPU which were missing source. That is, they were only available as blobs. The possibility of reverse engineering those blobs existed at the time. Although that takes a lot of effort, we’ve done it numerous times before. But they never asked. Had they done so, we would have also told them about another major offender. That’s the microcontroller in the chipset, which needs a signed firmware binary. By “signed” I mean a state-of-the art cryptographic verification mechanism. The chipset will refuse to run any firmware unless it was signed by a secret key held deep within Intel’s most secure dungeons. In short, this blob isn’t going away. It was obvious to me from those first versions of Librem’s web page that the designers behind it had no idea about the binary situation. My impression was that they never contacted knowledgeable parties about it. They were reinventing the wheel and they were doomed to fail. But that wasn’t to be. A month or so later, the subject popped up again on #coreboot. This time, they were considering crowd-funding. The information they provided via their website has changed as well. They were now claiming to be working with Intel about releasing source code for the early initialization blobs, and talking about disabling the chipset microcontroller entirely. That sounded like a reasonable plan, with only one deadly fault: Intel doesn’t release this type of source code, and the Intel decision-makers do not talk with low-volume customers directly. Not even Google could get the source code out of Intel after shipping millions of Intel Chromebooks. The few hundred units that Purism was planning to build was definitely not going to cut it. By that point, I made up my mind that the people behind Purism were either naive, or full of it. Deep in my heart, I wanted them to succeed, and I wanted to personally congratulate them for said success. I’m a coreboot developer; I know how this business rolls. I can make your firmware email me a daily digest of your passwords and Facebook activity, and you wouldn’t even know about it. I know what I’m talking about. Fast-forward to the middle of January. Librem’s crowd-funding campaign had been extended from December to the end of January. A lot of new information also appeared on their web pages. Besides a quote from Richard Stallman, suggesting the FSF endorses their project, their campaign page was filled with buzz-words that seemed to have come straight out of Stallman’s most iconic speeches. The claim was that Librem is “designed to respect your privacy”. There was also a graphic representation of the software stack. A green square meant libre, while a white square meant closed. There was so much green on the reverse pyramid of the graph, that it was too easy to miss the two or three white squares at the base. They were the platform firmware. That’s the part that emails me your passwords without any of the green dots above it being aware. Finally, by January 22, a ZDNet article appeared which confirmed what I had predicted all along: that Librem will ship with proprietary firmware. That’s announcement came just a week shy of the crowd-funding campaign drawing to a close. With proprietary firmware, Librem is just as free as any other laptop on the market with GNU/Linux. Or in other words, it’s not any more free. It is certainly not libre. So at the end of the day, Librem is bringing nothing new to the market. Laptops with libre operating systems have existed for decades. The only real innovators in this area have been Google and GluGlug. Google ships partially free firmware, although insufficiently libre to be able to provide the “respect your privacy” guarantee. GluGlug can make this claim, and it ships laptops with fully libre firmware. The downside of GluGlug is that it’s an aftermarket add-on. GluGlug and Google have been in business far longer than Purism. So, what has Purism brought in that’s new and exciting and libre? Nothing. Last time I talked about the benefits of using sed to transform repetitive low-level patterns into meaninful function calls. And still, doing all that regex magic did not get us a fully working replay. A great portion of the hardware initialization flow is based on situational awareness. What hardware is connected? What are our capabilities? What if …? That means a simple sequence of writes is, in most cases, not sufficient. We may need to modify registers, wait on other hardware, or respond differently to hardware states. While that seems daunting and tedious, it gives us an unexpected advantage: that every execution of the blob produces a different trace. I’ve chosen an example that shows similarities rather than differences, as I find this to be a more interesting case. Since we’ve already established that 0x2004 is our data port, as long as we don’t touch the index port, we’ll be reading from the same register, in this case 0x3f54. Now the values returned by this register are completely different in every trace, yet the behavior of the blob is strikingly similar every time. The first key observation is that this register increase monotonically in every trace. It also increases by roughly the same amount on successive reads. The differences between the last read and first read of the register are also strikingly similar in both traces: 0xa08 and 0xa02 respectively. The ’32’ in the delay is a hex number. Doing a bit of hex math we see we’re waiting about 51 ticks per microsecond. Comparing more loops, we get between 50 to 52 ticks per microsecond. Since a delay loop normally waits until the minimum time has elapsed, we now have a very convincing case that register 0x3f54 implements a 50MHz monotonic timer. Every time before accessing this register, we also poke register 0x3f50. That looks very much like the timer control register. Now when we rerun our logs through the script, the results decrease in size from 20K lines to 13K lines. The diffs between processed logs also decrease in size significantly. All the more proof we were right! There’s another way in which diff is excellent for our purpose. We can implement our helpers to generate the same output as the processed logs. That allows us to poke the replay from userspace, yet get the same output format. Now we can diff the replay and original log, and observe how the hardware state changes. We can even go as far as implementing our delay with usleep() instead of the timer at 0x3f54. When the diff is independent of the delay method we use, we have another strong proof our assumptions are true. This is the case here. ‘diff’ is an extremely powerful tool. Despite its name, it can show similarities just as well as differences. While regular expressions exaust their usability with simple patterns, diff can take us a lot further. Now that we’ve cracked the delay implementation of the blob, we can more easily see delay and wait loops — again, using diff. Complex, multivariable patterns are too awkward to handle with sed. I’ll go over those some other time. However, once such patterns are simplified to a function call, diff can once again show the story. Different GPU model? diff. New display? diff. HDMI connected? diff. It’s almost as versatile as det cord . Since we’ve converted all our newlines to carriage returns, we can match patterns from multiple lines. It doesn’t matter what we think these patterns do, or how we call the new functions. We’re just interested in grouping them to see the bigger picture. I could as well have called these hamburger() and french_fries(). Since the registers are 32-bit, then their address would be reg << 2. Thus [019c] becomes 0x0760. These read-modify-write sequences appear in the replay trace. Now we have the opportunity to look for more advanced patterns, and even identify any code that is not in the AtomBIOS tables. This, in turn can allow us to figure out what actually turns on the display. There is still a huge gap before having anything close to native init. What we’ve done here is develop a coreboot-level understanding of the init process, and made the first tiny step towards native VGA initialization. While there is only so much regex substitution can do for us, it is a necessarry first step towards a larger understanding of the problem. Transforming 0x0760 to 0x019c is ill suited for regex. Identifying more complex patterns such as waiting for a condition, or delaying a set amount of time is also a more demanding task; however, the power lies in the ability to script and automate the conversion from a nonsensical log into something more human-friendly. It then becomes trivial to diff several traces and see higher-level patterns. I’ll discuss those some other time. This is it. The beginning for QiProg has ended. It has been a long and tedious journey to equip the Stellaris Launchpad for Low Pin Count mastering. The hardware is built, and it works. The software is there, although its contribution to the ecosystem is somewhat minimal — it is more of a bridge than a road in itself. The real value lies in the firmware. To the best of my knowledge, LPC bus mastering has not been implemented in a microcontroller without using ASICs or FPGAs. The vessels are here, and now it is time for the explorers to start their journeys. Why do I talk like this is project is not over? It is not over. Although I have attained the minimal goals, there is a whole new world to explore. Integration in flashrom was one of the targets I had really hoped for, but was unable to complete. Is writing of the chip working? Yes. Is it reliable? Writing and verifying predetermined patterns works. Disturbingly, when I plugged in output from /dev/urand, the write did not verify. Some bits were simply not programmed, although the majority of the chip matched. Is it the LPC bus mastering that is at fault, is it the command sequence, or are we not giving the chip enough time to complete the operation? Will chips other than the SST 49LF080A work? Can we write a complete ROM image and boot a machine? This is the exploration phase: we have built it, now let’s make the most of it. Time has been tight for the last month. I had forgotten to plan for the start of the fall semester, and my time since this event has been severely crippled. I wish I could have achieved more. I took the last two days off from the University to organize the last few weeks’ salad of stashed and uncommitted changes into readable patches. I don’t feel sad, just tired. Exhausted, I have nothing left to keep me entertained but an Alec Bradley Presando cigar, which I have been saving for a special occasion. This is that occasion: QiProg has stopped being a commitment, and became a hobby, a child, something to care for. Now is the time to build your VultureProg, get the software, and start reporting those issues you know you will encounter. I’m in Houston, and I don’t have a problem. In the previous two posts, I was developing a bigger issue that has became more and more apparent. The USB QiProg protocol is not completely specified. I didn’t think much of the “TODO” items in Peter’s original protocol. I figured I’ll figure them out as I go along, and I did figure out a lot of little details as I went along. Of course, none of those details related to implementing the big TODOs. So, here I am in week 11(?) with an incomplete protocol. Last week did not see much coding. I spent some quality time with premium cigars, a pen, and engineering paper. I wrote the name of each function I needed to implement, left a blank space, wrote the name of the next function, and so on. Then, I drew the packets, laid out their structure, went through the process of thought experimentation, crumpled the piece of paper, threw it again, and started from scratch. I eventually settled on a protocol “completion” which I though was acceptable. I wrote it up in digital form and submitted it to Peter for review. Communication with Peter is asynchronous. Very rarely do we both meet up on IRC to discuss the details in real time. Therefore, I decided to implement the “completion” protocol as-is, and modify the implementation later should the protocol change. This should keep me occupied with coding. I am very happy I can get back to coding. Working out protocol details is exhausting and boring. It is a bit frustrating. We have firmware code to read, erase, and byte-program, yet the puzzle is not complete. I was expecting the LPC bus mastering to be the most demanding, and USB communication to be an almost transparent add-on. That would have been fun! The reality is the opposite, but, besides the aforementioned frustration, it’s still fun — albeit a different type of “fun”. It’s time to scrap weekend plans for the next couple of weeks, and kick in the overtime. Until next time, get your Stellaris Launchpads, order your VultureProg PCBs, and stay tuned. This baby is going to run smokin’ hot.